Here at Sissinghurst our garden team is in a very fortunate position, not only do we get to look after one of the finest gardens in the world, but we are amongst only a handful of National Trust properties to have our own nursery. The nursery is situated behind the Rose Garden. The polytunnels and standing out ground. Despite having over 300 gardens within the Trust, nurseries are very rare with very few gardens having the facilities to grow and propagate their own plants to the degree that we do at Sissinghurst. My role of propagator is an even rarer thing with only 4 or 5 people in the Trust lucky enough to have a job in propagation. Our nursery has two major priorities – to grow plants for the garden (and as an off shoot of this, the plant shop) and to conserve Sissinghurst’s extensive plant collection. At Sissinghurst, having a nursery gives the garden team a much greater degree of flexibility and choice over the plants they use in the garden. As the propagator, I am able to source seed and grow plants which are not available from commercial nurseries, allowing the gardeners to be more selective in their choices and giving them access to a greater diversity of plant varieties suited to the style of Sissinghurst. Young plants growing on in the glasshouse. For next season I currently have 532 different varieties of plants to grow for the garden from seed. This number has jumped by almost 130 additional seed varieties due to the ongoing White Garden research project currently being undertaken by our head gardener, Troy and his researcher, Monique. 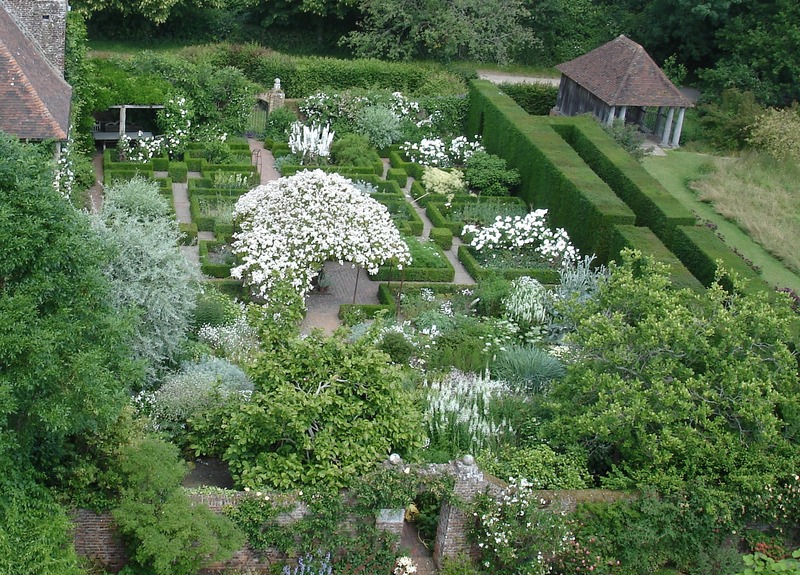 In this project Troy is researching the origins of the White Garden and looking at renewing the planting scheme to bring back the essence of Vita Sackville-West’s original garden. Projects such as this highlight the importance of plant conservation as the research has revealed to us many plants that have been lost from the garden over the passing decades. Conservation is a key priority of my nursery. In conjunction with the National Trust’s Plant Conservation Centre (PCC) I am looking at Sissinghurst’s plant collection and creating a significant plant list. This list indicates those plants in the garden which are rare (not commercially produced or grown elsewhere) or those which are historically important to Sissinghurst. 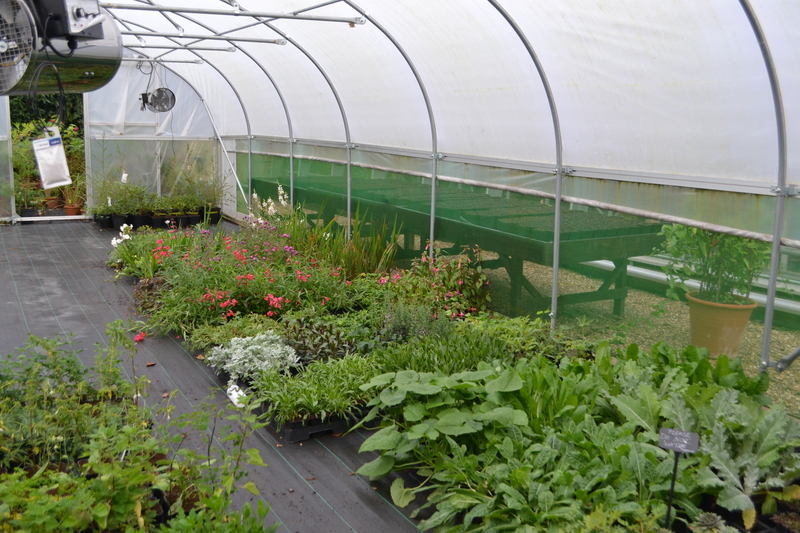 Once identified these plants will be propagated and progeny of the original plants will be grown in the nursery so that if the parent plant is ever lost we will always have young plants with which to replant, therefore conserving the variety for the future. On a recent visit, the head of the PCC described this kind of conservation work as being as important as conserving the books, furniture, paintings and artwork held by the National Trust. Just as our colleagues are curators of these collections, we are the curators of the plant collections and it is essential we take the same care and effort to conserve them. Plants growing on in the polytunnel. Iris ‘Placid Waters’ , Iris ‘Three Oaks’ and Iris ‘Shannopin’ – All three are located in the Rose Garden, none of these varieties are commercially produced and it is unclear how many examples remain in cultivation the UK. Myrtus communis – Located in the Top Courtyard, this plant may seem fairly common but it is the historical significance of this plant to Sissinghurst that makes it special. The plant is believed to have been propagated from Vita Sackville-West’s wedding bouquet. You’ll love the Great Dixter Plant Fair, held this weekend (4th and 5th Oct) at Great Dixter in Northiam, East Sussex. As far as plant fairs go, this one is perfectly formed. Small and charming, each nursery has its own hand-made wood and corrugated iron shack in which to display their plants. There are about 23 specialist nurseries invited to attend both from the UK and Europe, giving even the most avid plant collector plenty of opportunity to get completely carried away. And when you’ve spent all your money and can fit nothing else in your car, you can flop onto a straw bale and stuff yourself with sausages, cake and coffee. Thus restored, take a stroll around the garden before heading home, no doubt poorer but happy! This entry was tagged nusery, propagation, Sissinghurst. Bookmark the permalink. Beautiful photos, thank you for sharing insights to the wonderful Sissinghurst and what it takes to keep it ticking…I love seeing what you guys are up to! I think this is a fabulous approach. I often think the earlier varieties are more elegant. I am sure I saw Three Oaks in a garden recently, the owner didnt know the variety as she had had it for ever so I will have a rumage and see if I can find a photo and compare it. I am determined to come to Sissinghurst next year, I might try and combine it with the plant fair, just need to sort out some accommodation.